I've been away for some time. I'm a bit bored and with some time to spare. 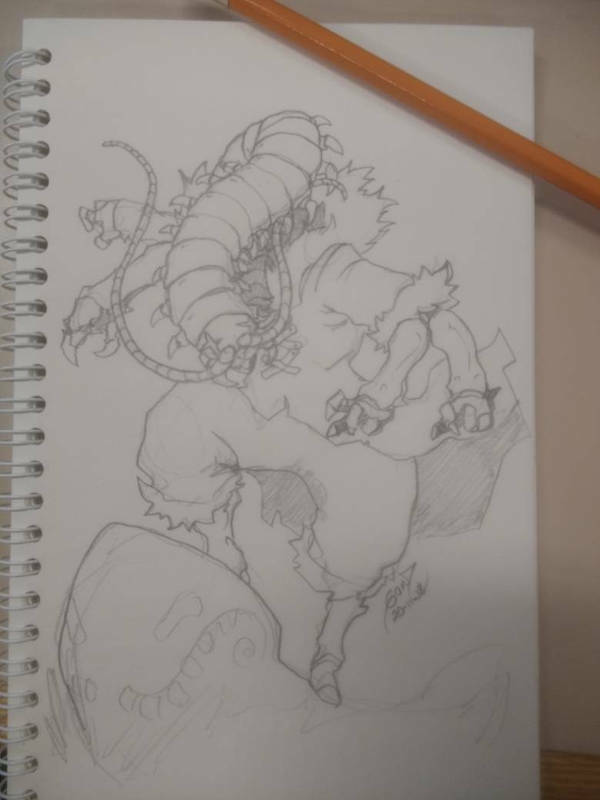 If any of you guys have an interesting lunar exalted concept I'll make a quick sketch and share it here. I'll gravitate towards the ones that catch my interest the most, but I'll try to cover many of your suggestions. I had a No Moon NPC, a giraffe totem who wears neck rings in a manner reminicent of women of the Kayan tribe of Myanmar to hide his tell of a long neck and in my mind he's aesthetically something between that and Zulu. Seemed like something you might be able to have fun with. I'm playing Dr Soma, a female Indian (or Burmese)-looking doctor (late 20s) with snake fangs. And, you know, she can turn into a scaly snake-woman, of course. I'm not quite sure what she'd look like in terms of being a doctor though. I know what medieval European doctors might look like, but not Indian ones. Maybe you can think of something interesting with that. Last edited by The Wizard of Oz; 11-13-2018, 03:38 PM. 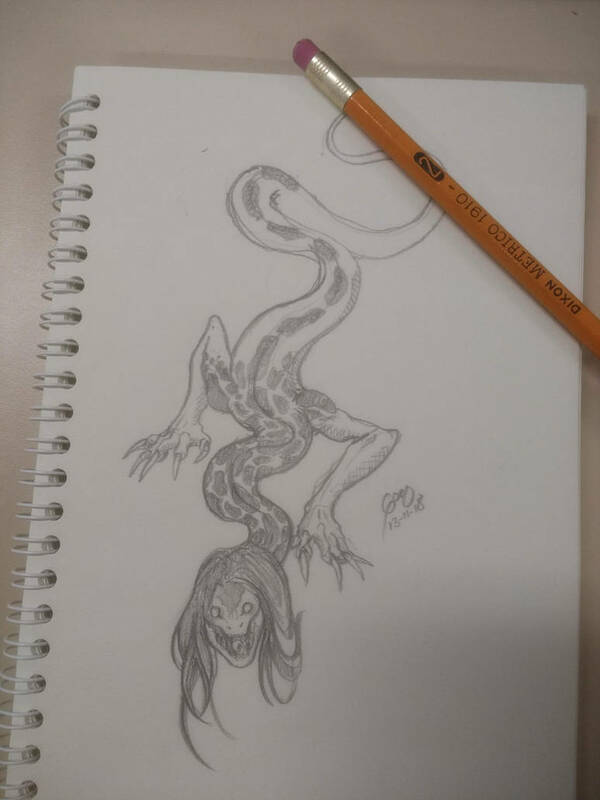 Snake woman is always interesting to try. Ooooo, nifty! Might as well toss my own hat into the ring! Silence is a Full-Moon whose spirit shape is a mantis. Formerly a child soldier, he and his comrades deserted and tried to escape to safety but were intercepted by a Wyld Hunt with intel that they were harboring a Lunar among their number. He wound up Exalting in the ensuing battle; someone up in the Bronze Faction got a real earful because dammit you guys, we JUST had that seminar on self-fulfilling prophecies last week! With charts and everything! In human form, he's small and slightly-built, but all muscle. He has bronze-colored skin and leaf-green hair, with two antennae poking up from his brow as his Tell. In War Form, he's a ten-foot whirlwind of scything death, with one upper pair of forelimbs that end in serrated sickles like twin daiklaves and one lower pair with more human-looking hands for fine manipulation or martial arts. I have an old Lunar I am fond of. Thousand-Hands Sati, a scary centipede-Lunar who is blind after having her eyes cut out and (in human form) bald with blue skin. Alternately, I briefly played a leopard seal lunar who is just a chubby friendly smiling ball of fun and murder, who let me play with Inuit and Siberian inspired cold weather fashion. 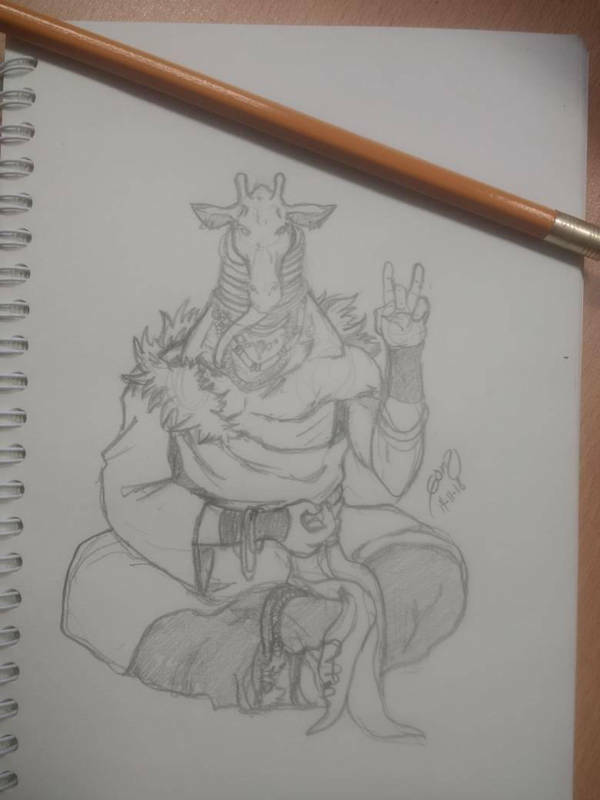 I'm not an expert on Zulu clothes, but here's my humble interpretation of how a giraffe lunar could look like. Last edited by Gonzo; 12-06-2018, 05:56 PM. Oh he's magnificent, thank you. I did not expect a Giraffe Lunar to look like that, but it's great. This concept was very challenging. I'm actually curious to see how Sati turns out as well. Great character concept. From the same game, Far-Reaching Echo (my character) was a desert-monitor Lunar who mostly just used her tail as a third arm for sword lunges. She was also working alongside the Shogunate at the time as a desert soldier to patrol the Southern lands for raksha (looooong story), so initial conception would be her in a desert-style genzosha armor. Was probably three or four sessions away from either leaving the Shogunate forces, or getting killed, but she was still friends with her old squadmates. I've got an NPC Lunar in the works. She's a rabbit totem scholar, whose primary effort is in writing subversive literature attacking the Realm and Immaculate philosophy. She has several pen-names variously for critical essays, parody plays, and ribald etchings. She usually tries to escape combat, but if she's cornered, she whips out a double-barreled sawn-off firewand, in the hopes that a surprise counterattack will give her enough time to escape. So basically a tubby rabbit with a shotgun, in a flurry of upturned papers.